Curious about our Diabetes Summer Camp at Brock this coming August? Or just feel like getting active with your T1 friends? Join ICD at Brock University as we Kick Off the Summer together! We will have a blast at Brock, on the field, in the gym and in the pool – not to mention rowing in Brock’s rowing tank with an Olympic Rower and a member of the Brock rowing team! Parents, plan to stick around after drop off after for our Parent Workshop! Join peers, ICD staff and local advocates as we share tips and strategies for navigating the school system with a child with t1. We will have a chance to review the latest documents from the Ministry of Education regarding support of our kids in school, and discuss a positive, one team approach to affecting change in Niagara! Coffee and snacks provided. 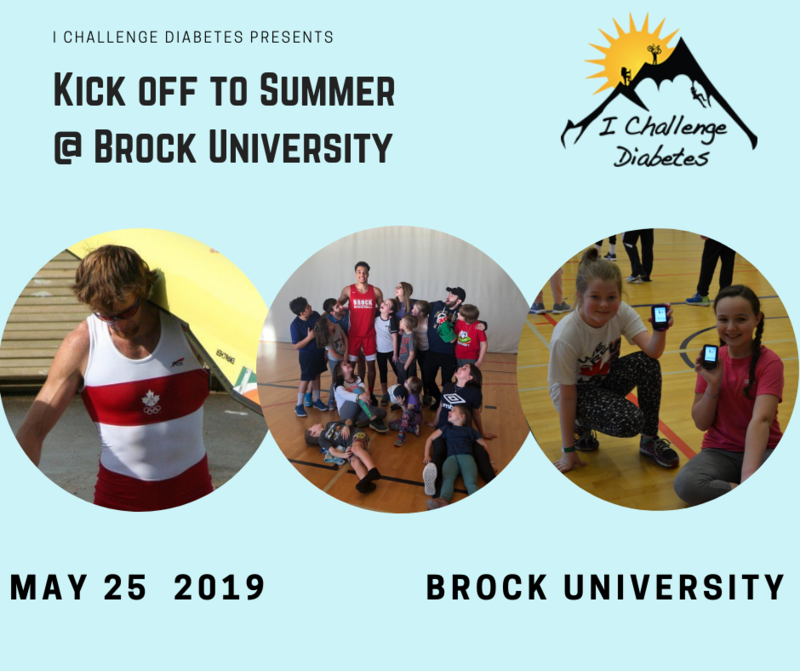 Overview: This is a multi-sport day camp at Brock University that will provide diabetes support, education, mentoring and normalization, integrated with awesome workouts, skill development and whole lot of summer camp fun for all ability levels. Who: The program is open to children with and without type 1 diabetes aged 5-15. High school aged volunteers can earn community hours. Please note, lunch and snacks are not provided. Diabetic low supplies will always be on hand. Diabetes Empowerment: We will connect with parents/caregivers at the start and end of the day to capture any directions from parents for the day and follow through with a flexible support plan. Any issues would be taken on by our team onsite. We track all tests, snacks and insulin on our log sheets, integrated with activities to provide a daily print out with pointers for potential adjustments, where needed. We are flexible with your needs and can build that confidence over the course of our programs. “I would first like to thank you so much for such an amazing camp!! My son had a great experience and met some new TD1 friends whom he still keeps in touch with. The camp was great in that he was kept active all day and he looked forward to going every morning (which is no easy feat during summer vacay).Having the different spokespeople talking about diabetes to the campers also had him coming home and talking about his day and what he learned.